When it comes to multiple choice tests, there’s this common piece of advice that always gets thrown around: When in doubt, always pick C.
At least, that’s the letter I was told–maybe you heard it was B. Whatever the letter, this advice pops up everywhere. Truer words have never not been said. To make sure you’re not basing your multiple choice strategies on questionable advice, today we’re going to go through some more well-founded and useful advice you can use to make sure you ace your next multiple choice test. I’ve got five main strategies to go through as well as one secret weapon (of sorts), so let’s get started. Gotta warn you: tip #1 is a game-changer: Make sure you put your name on your test. However, another benefit of doing this is that you’re priming your brain a little for each question. Sometimes, multiple choice test questions will contain details that might hint at, or even outright answer, other questions on the same test. Which American President’s death caused Napoleon to order 10 days of mourning in France? Now, even if you know nothing about the boundless respect Bonaparte had for one of these men, there’s an answer here you can immediately eliminate. Still, maybe you’re stumped about which of the three remaining answers is correct. True or False: Even though John Adams and Thomas Jefferson were bitter rivals during their later political careers, they eventually became friends again and remained so until their deaths in 1826. Now, let’s say you do you happen to remember that Napoleon himself died in 1821. If you knew that, then the second question contains the answer to the first. There might not always be details like these in your tests, and you shouldn’t spend a ton of time trying to dig them up – after all, preparing in advance is much more effective. Still, this can be an easy way to find the answer if you’re stuck. Or, as I like to call it, the Tiny the Tiger method – because it’s like that boss fight in Crash Warped where you alternate between fighting Tiny and easily avoiding a bunch of lions. 9o’s kid video game references aside, however, this is a really helpful method that I learned about in Barbara Oakley’s book A Mind for Numbers. In this technique, you start by jumping into a really hard question and working on it for a few minutes. If you can’t get the answer, then you immediately jump to and work on an easier question. This prevents you from wasting time bashing your head against questions you can’t answer, but it also has the added benefit of engaging your brain’s diffused thinking mode. When you actively work on a problem, you’re using your brain’s focused mode. This mode is great for doing complex mental tasks, but there’s a limited amount of time you can spend in this mode before getting burned out. By switching to an easier problem, you allow your subconscious mind to work on the hard problem in the background. This gives you a better chance of being able to answer the hard problem when you return to it later. This is my unnecessarily complicated acronym for: Read the freakin’ question twice. Multiple-choice questions are really tempting to breeze through, and it can be easy to skim the question and immediately start looking for answers you’re familiar with. But these questions can be tricky, so you need to make sure you understand exactly what they’re asking. Which of the following is MOST correct? ALL OF THE ABOVE or NONE OF THE ABOVE. I’m not proud to say that there was at least one time in college where I rushed through a test and marked a correct answer without ever seeing that there was also an “All of the above” choice, which was in fact correct. Oops. I always found that double checking the entire test at the end was overwhelming, and I’d tend to rush it. I still think you should do this (and budget time for it), but you should also briefly double check your answers once you finish each page. When you do it this way, there are only 5-10 questions to check, and you’ll be far more likely to catch little mistakes like marking the wrong letter, or not noticing some small detail in a question. If you get to a question that you can’t remember (or if you feel like the answer is on the tip of your tongue), then try this: imagine that you’re in the place where you first learned the material that relates to the question. Whether it’s the lecture hall, your dorm room, a shady nightclub in 1940’s Paris, whatever. Just picture the place as vividly as possible. When you envision the place you learned the material, you take advantage of what’s called context-dependent memory, which describes a phenomenon in which people are more likely to remember information when they are tested on it in the place they learned it. As a 1984 study by Stephen M. Smith showed, however, even visualizing the place you learned the material is enough to get much the same effect. Who said imagination would never help you ace a test? Now, onto the secret weapon. Inevitably, you’re going to come across questions on your tests that you just straight-up don’t know the answer to, which means you’re going to have to do some guessing. Maybe you can narrow down your choices by eliminating answers you know aren’t correct, but occasionally you’re going to run across a question where know literally nothing and can’t do any narrowing down. In this case, instead of randomly guessing, you can use statistics to exploit the flaws in how humans write multiple choice tests. As the author William Poundstone shows in his book Rock Breaks Scissors, human beings are not very good at creating actual random distributions of answers. In his research, Poundstone did a statistical analysis of 100 multiple-choice and true-false exams from lots of different sources: schools, colleges, professional certification exams, driver’s education quizzes, etc. And what he found basically debunks the simplistic advice from the Jimmies of the world. On four-answer tests, B was slightly favored to be correct – 28% of the time. On five-answer tests, E was favored – 23% of the time. In these same tests, C was actually the least favored at 17%. But those are the least interesting results. True-false exams are truth-biased. 56% of answers were true, only 44% were false. Consecutive answers of the same letter are less likely. It’s slightly likelier than not that an answer’s letter will differ from the one before or after it. In tests where there were three choices per question, a question’s correct choice was the same letter as the previous question only 25% of the time, rather than the 33% that would indicate true randomness. This is also true of true-false questions, where Poundstone’s research found that answers alternate 63% of the time. Continuity errors. If the answer makes the sentence grammatically correct, it’s more likely to be true. The most significant of all. “All of the above” or “None of the above” answers were correct 52% of the time when such an answer was present in a question. All of the above tips are great, but ultimately, preparation is the most important aspect to succeeding on any test, including multiple choice tests. Nonetheless, the tips I just covered should help you increase your score in the event that you get stuck on a question…which is pretty much inevitable. 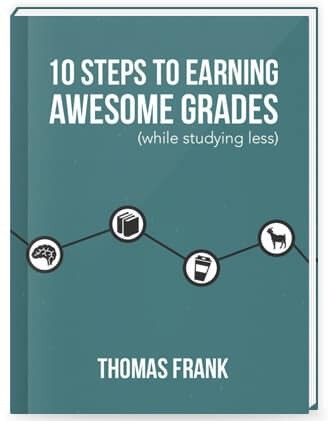 If you want even more advice on dominating your finals (multiple-choice and otherwise), check out my Ultimate Guide to Acing Your Final Exams, which is a collection of all my best content on studying and test taking.